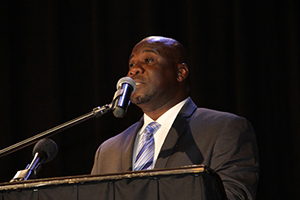 NIA CHARLESTOWN NEVIS (October 21, 2014) — Minister of Agriculture on Nevis Hon. Alexis Jeffers says the Nevis Island Administration continues in its thrust to expand crop production. Mr. Jeffers made the comment during his presentation at the 8th Consultation on the Economy at the Michael Herald Sutton Auditorium at the Nevis Performing Arts Centre (NEPAC) on October 15, 2014. He highlighted some of the priority areas and the successes that had been achieved by the Department of Agriculture and the priority areas it would focus on in the short to medium term. “The expansion in crop production is a major priority of the Ministry of Agriculture. Over the past few years we have seen an upward movement in the production of various crops and we intend, through the efforts of the Department of Agriculture, to continue and increase that momentum. “Special mention must be made of onion production which was revitalized last year. We were able to realize approximately 40,000 lbs. of onion from nine acres with a net profit of over $46,000.00,” he said. For the current production cycle, Mr. Jeffers explained that 12 acres of land would be targeted, four of which had already been cultivation. The Agriculture Minister also spoke to other expected increases where other crops were concerned. 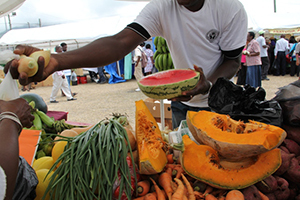 “We are also predicting continued increases in the production of other crops such as tomato, sweet pepper, watermelon, cantaloupe, honey dew, sweet potato, pumpkin, butternut squash, okra and cabbage,” he said. Meantime, Mr. Jeffers assured that his Ministry would continue to promote greenhouse technology. “My Ministry has been and will continue to promote greenhouse production or protected agriculture. This technology has the potential for increased production and productivity. A farmer would be able to realise more products in a smaller area of land space, thus, maximizing land use. “Additionally, better quality products are guaranteed, which of course will fetch higher prices and therefore, higher profit margins. One farmer on the island has already invested in this technology and the production is simply outstanding. 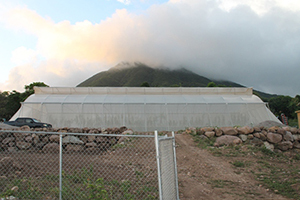 The Department of Agriculture has refurbished one green house at Prospect and is in the process of procuring another through the kind assistance of the Inter-American Institute for Cooperation on Agriculture and Caribbean Agricultural Research and Development Institute,” he said. Apart from the expansion of crop production, Minister Jeffers noted that fruit production would not be left out. “Along with the expansion in vegetable production, is the expansion in fruit production as well. Some excellent work is being done at the propagation Unit at Prospect and the output there has been the best ever in many years. “During the Agriculture Open Day held in March this year, we had the most propagated plants on sale ever in the 20-year history of the event. We are seeking to increase fruit production at both the household level as well as the Department [of Agriculture] level,” he said. On the matter of value addition in agriculture, Mr. Jeffers also spoke about the Agro Processing Centre. “With regards to value addition, mention must also be made of the work being done at the Agro Processing Centre as well. The range of natural, nutritious local fruit juices continue to increase with numerous blends of various fruits. The Unit will also be placing added emphasis on the traditional crop cassava and the range of by-products that can be made from it. 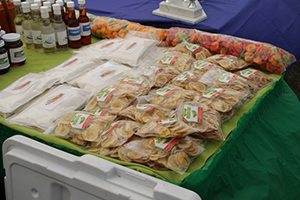 “The agro processing sub-sector on the island, has been growing in leaps and bounds. Our local agro processors have been improving both in terms of their range of products as well as their packaging and overall quality of their items that they offer for sale,” he said.